As I described in my article "Preparing Your Equipment For Deployment". My equipment is modular to avoid bringing "too much" equipment, or not the right equipment. 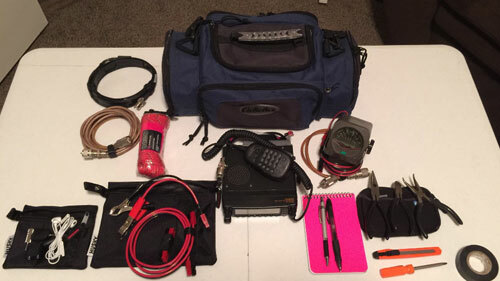 The HT GoBag is the primary response bag that contains not only an HT Radio but basic tools and supplies. Therefore, the Mobile Go Bag subsidizes the primary bag adding additional capability to the deployment. To be prepared, each station should have the transmitting power of a mobile rig. HT's are a compromised radio for convenience, they should not be considered an operating posts primary radio tool. Also for modular reasons, the power is a separate item. ⚠️ Disclaimer: Some of the links in this description are affiliate links. If you make a purchase through these links you'll help support the channel at no additional cost to you. Thank You!